As of 4 pm on Tuesday, 9 Republican Senators have publicly stated they will vote against the Senate’s health care bill. While some want more dollars, care, and support, others want a complete repeal. This puts Majority Leader McConnell in an unwinnable position; everything he gives to the moderates upsets the hard-right Senators. While McConnell continues to say they’ll vote on the bill after the July 4 recess, that’s unlikely. He rammed it through in secret precisely out of fear that the longer it was in the public eye, the lower the chances for passage. Rest assured Senators will get an earful when they return home to do the parade thing. While many Republicans will be assailed by hard-right activists for failing to deliver on “repeal and replace”, many are likely raising a toast to the gallows they just avoided. There are two reasons for this. First, neither of the Republican bills would do anything to address the real problem – healthcare costs. insurance costs are high in large part because healthcare in the US costs way too much and about a third of that spend is unnecessary. So, if the bill had passed, it would have done nothing to keep costs low, and the Republicans would be getting the blame for higher premiums – as the Dems have since 2014. More immediately, the House or Senate or some combination bill would have crushed core Republican voters – white, working class, generally older Americans. BCRA/AHCA would have led to sharply higher insurance premiums for many, while their poorer neighbors would have lost the Medicaid coverage they gained, if they are fortunate enough to live in a state that expanded Medicaid. The average net increase for a silver plan under BCRA was, according to the CBO, 74 percent. Older people – like me – would have paid much more than that. And that’s why the glasses are clinking in the bars around Capitol Hill. What’s next? Hopefully Republicans will allow Democrats into their discussions, so both parties can work on desperately-needed fixes to ACA. A great start would be telling insurers the Cost Sharing Reduction payments are going to happen. This would stabilize the current situation so they could start working on permanent fixes. While that would be best for the country, I’m not sanguine about the likelihood that will happen. If Trump et al kill the CSRs, premiums will jump by a lot, and that could be the death knell for individual coverage. Here’s hoping Congress does some real live work for the people, instead of this symphony of dysfunction we’ve been witnessing for the past few years. If it does, we’ll be in a whole lot better shape next near. If either of these bills passes and becomes law, I strongly recommend more Americans get passports, especially the middle class, so they can avail themselves of excellent care in other countries.Those too poor may also find ways to go abroad if the medical travel industry caters to them. This is not just my opinion, this is the opinion of the editor of two medical travel newsletters and many others. 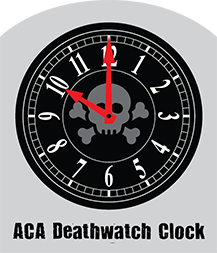 The time for medical travel will be here if the GOP gets its way. It would be great to see them work together to hash out a plan to please everyone but is that even possible? Let’s be realistic. No matter what direction they go they will tick off millions of people and/or drive the nations debt even higher then it is. I think what is being forgotten in this whole thing is that in all reality it isn’t the governments job to provide healthcare to people. I feel bad for those who have pre-existing conditions or those who struggle financially due to situations outside of their control. That would be hard. And taking from the middle class/wealthy people to give to the poor and/or those with pre-existing conditions isn’t the answer either. It isn’t the right thing to do. It isn’t “fair” to have a pre-existing condition but it’s also not “fair” to take money away from hard working people. And wealthy people work hard too (A fact people forget). I have a hard time fitting the bill for people who don’t take care of themselves. When I worked in the hospital I remember thinking…if there wasn’t smoking, obesity and diabetes (all preventable) then I may not have a job. Why can’t the focus be on personal responsibility? If I own a car and I drive it recklessly, don’t care for it, don’t change the oil, put in bad gas, etc. then why should others be forced to pay for my car to be fixed up? Why should everyone share the mechanic’s bill? How is that fair to everyone else? It isn’t. I believe if the government backed away, put all the accountability on people taking care of themselves then two things would happen. 1) They would take care of themselves knowing if they didn’t they wouldn’t get the care they need. (If they stayed healthy they probably wouldn’t need much care anyway). Of course I only speak of personal health and exclude injuries from accidents. I think catastrophic coverage should be available to all people. And why wouldn’t it be? I believe costs could be fairly low for all people regarding catastrophic coverage. I just don’t believe in big government and I am a big advocate for personal responsibility. I completely agree people who make poor lifestyle decisions should be held financially responsible. Unfortunately a lot of pre-ex conditions are not lifestyle related, or perhaps slightly related. I talked to a mom earlier this week whose son is about to turn 26, is finishing school and has type 1 diabetes. She is terrified that he will lose insurance coverage for life due to his pre ex. And that’s just one person. Yes agree. You could lump those pre-existing conditions, that are not caused by lifestyles or bad decisions in the category of catastrophic injuries. I believe there would still be enough money to go around if you take out all the money that is spent on people who have preventative diseases and health problems due to choices. I would hope all Americans want what’s fair. Thanks Joe. Thank you for pointing out this fact to Spencer, Joe. Not every pre-existing is preventable. My husband has end stage renal disease. Not because he lived an unhealthy lifestyle, but because he has Type 1 Diabetes (it runs through all of his family). Prior to Obamacare, he could not get good insurance coverage for this because no one would insure him. So he had county coverage which only allowed for one type of insulin. And after 20+ years of taking it, we found out it was a kidney killer. So now he has kidney disease because that also runs in his family and the only drug he was able to take for diabetes attacked them. He’s only in his 40s! Thankfully ACA allowed him to get coverage through my health insurance and he has been able to treat his kidney disease and try to get on the transplant list. But without ACA? He would probably have already died. We are in fear every day that if these bills pass as the government is trying to do, he will be dead very soon. We can’t afford dialysis treatment on our own. It’s ridiculous. The biggest culprit as Joe discusses, are the costs of healthcare. We see DAILY the excessive costs and treatments done through our ‘for-profit’ clinic that are just truly unnecessary. They fill prescriptions for drugs we don’t even use in treatment any longer, continually re-do tests and labs because they “changed a form.” All of this adds up to an extreme dollar amount. Hopefully one day we look at the bigger picture.